Get the AMM or the Structual Repair Manual. You come here asking technical information on a damage repair? Why are you drilling out a hi-lock instead of removing the collar, or holding the collar and driving the hi-lock out with an allen key? If you've missed the hole, you're facing either enlarging the hole (with a reamer: this is a tight tolerance), or building a repair over the area and redoing all the other hi-locks, too. Edge distance between holes and tolerance per the structural repair manual may preclude both. If you don't have a repair noted in the SRM, then you'll need engineering involved. Nobody online can see the damage, and won't be able to provide specifics. It sounds like you may be doing work that you're not qualified to do, given your choice of tools, your method of removal, and your question. Regardless, if you've drilled into the spar, you've created a very dangerous condition and need to get someone at your location, who is qualified, involved immediately. Whatever you do, please, do the right thing and get the work checked and re-checked. Get advice from your peers. Do not try to cover it up. Hi lock was stock and I was told by my supervisor to drill from the tail due to lack of room on the other side . I enlarge the hole and It looks like a 8 perfectly.. In the trade, what you did is drilled a sno-man . Go to the SRM for the aircraft you are working on. Nothing we tell you here is valid if it can not be verified in the SRM for the aircraft you are working on. Your super may have meant to drill the head off and then punch the Hi-Lok's shank out. Have you ever removed a hi-lock? Have you ever removed a rivet? If you have access to the "tail," then you can easily either remove the collar by backout the Hilock body, or you can break the tail off. You understand that drilling a rivet doesn't mean you run the drill into the material, right? Drilling a rivet involves using a bit the same size and the rivet shank diameter of smaller, ensuring it stays center, and drilling the factory head (usually). 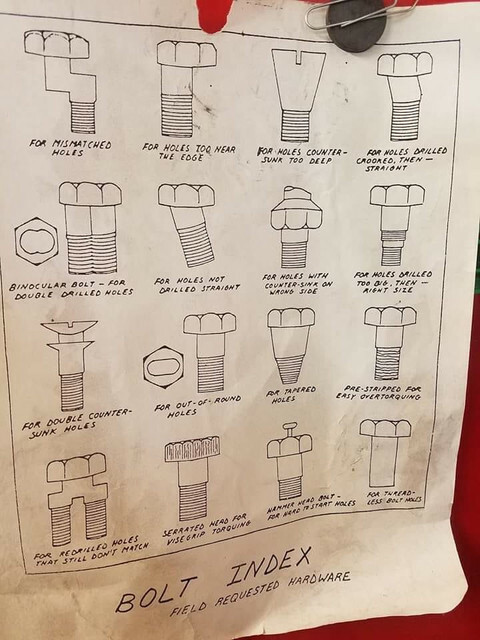 You drill to the depth of the factory head, inside the rivet only, and then use a punch to break off the head, and then use the punch to drive the body out the other side. You should never attempt to actually drill into a rivet beyond the head. Well depends. A lot depends on that thing called experience. Don't make sno-men holes and don't pooch the metal when you drive the rivet out and you are golden. You need a binocular bolt shown on the left side of this pic! If you’re lucky you might oversize the hole and get away with a larger fastener, but with a snowmanned hole you could have edge distance issues. You need to find a repair in the srm or get an engineer involved. Keep it legal and safe no matter what you do. Seems like if you had access to the tail to drill it, that you should’ve just took the collar off and knocked it out. But I wasn’t there to see how you ended up resorting to that. They say you learn the most from your screw ups, I believe that is true.